I decided on giving a Barielle a chance. I snagged 3 a few months ago when they were on Hautelook.com and I've only worn one of them! Jess' Champagne Toast is a gorgeous lavender with an almost metallic shimmer that has a slightly blue hue (I couldn't capture it in photos no matter what I tried). This is two coats. The formula was smooth. There is also some red and rainbow micro glitter sprinkled in this polish, although it was a bit too subtle to pick up anywhere but in the sun. I was pleasantly surprised when I walked outside and saw this polish in the sun. I was underwhelmed at first when I was in my house. It really came to life! So shiny and destracting!! 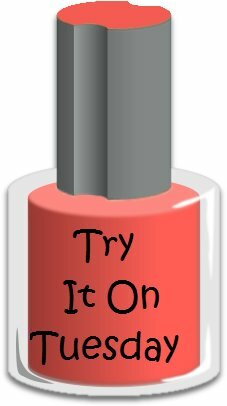 To see a complete list of all the bloggers participating in Try It On Tuesday, head over to Jilltastic Nail Designs. 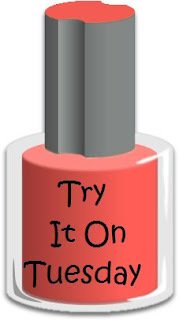 Beautiful color:) Would probably be great for stamping???? Could it be a one coat wonder???? Oo I really need to try that, i bought it at the same time and still haven't touched it. Beautiful nails and how perfectly you have applied these colors on your nails. And I must say you really have a good choice of colors too. This grey color of nail polish is adorable. it's very shiny and it's the perfect to be fit with any outfit in evening party.